Fiberglass Treaters | Clifton Supply Co. In many areas, residue gas is no longer available to be used for a heater treater. If you don’t require heat or your volumes are low, our fiberglass gun barrel treater may be a wonderful option. This 4′ x 20′ treater weighs approximately 1000 lbs. and can be manuvered with a fork lift or back hoe. It can easily be plumbed in with poly pipe. Several of our customers prefer to plumb the treater with poly using Victualic grooved style fittings as opposed to threaded fittings. The main reason for this is because of the ability to quickly disconnect the incoming oil line in the winter when it freezes. Instead of having to steam or wait to unthaw, the incoming leg is removed and set aside to thaw on it’s own. The new leg is immediately bolted up and fluid can be moving resulting in less down time and expense. There are two different styles available. The standard style has no internal componants. The fluid simply enters from the bottom and separates. The second style is designed with an internal downcomer/splatter plate. 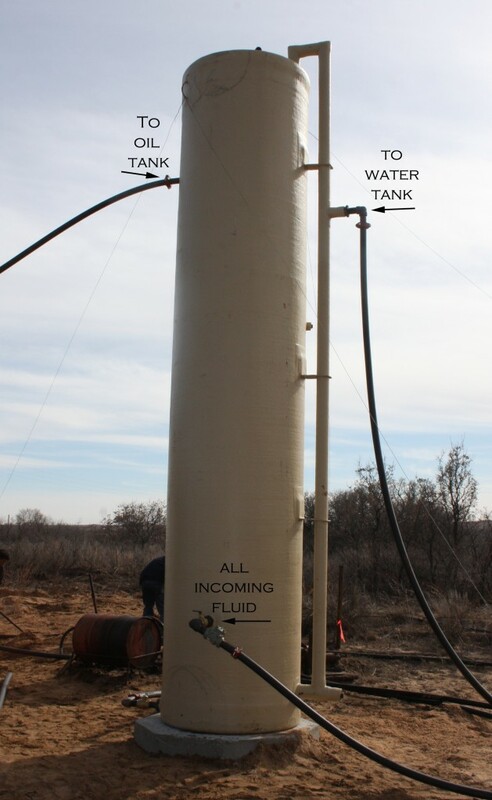 the design requires an extra plumbing leg, on the outside of the unit, in order to transfer the fluid to the top of the treater and gravity feed internal to allow more separation after hitting the splatter plate. The treater is equipped with threaded collars for heater probes. The heaters are an extra option that we do stock. We typically have the 4′ x 20′ treater in our yard for easy pickup. We will deliver within a 100 mile radius of Pampa for an additional fee. Please contact us at 806-665-0089 for more information. Clifton Supply Co. provides the highest level of products and services. I would recommend them to anyone. Thank you Clifton Supply Co.
- John Bateman, Bateman Industries, Inc.